Home Hardware carries a variety of items for your home including paint, cleaning supplies and seasonal items. Save with Home Hardware coupons regularly on all your favourite brands. 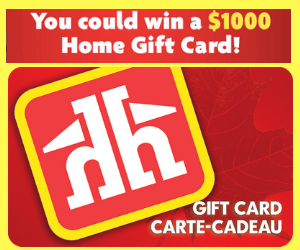 Enjoy the benefits of being a home owner with help from Home Hardware’s loyalty programs and contests. Win great prizes such as gift cards, shopping sprees and prize packs.